In loving memory of Isabella Elsie (Tibby) dearly beloved only daughter of Mr & Mrs John Fraser who died 1st July 1944 in her 23rd year. Also their son Alexander (Derry) RAF who died at Fayid General Military Hospital, Egypt 10th March 1949 in his 20th year. 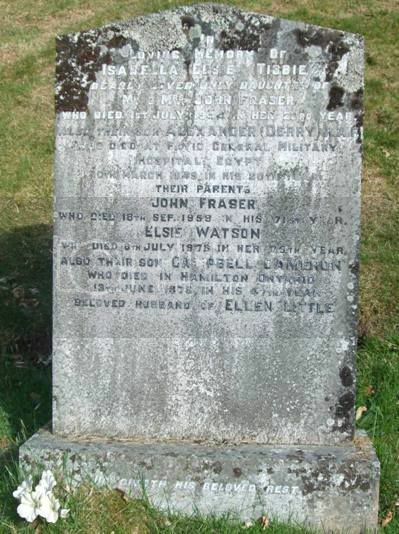 Their parents John Fraser who died 18th Sep 1959 in his 71st year. Elsie Watson who died 6th July 1976 in her 79th year. Also their son Campbell Cameron who died in Hamilton, Ontario 13th June 1978 in his 47th year beloved husband of Ellen Little. Sacred to the memory of Sergt. 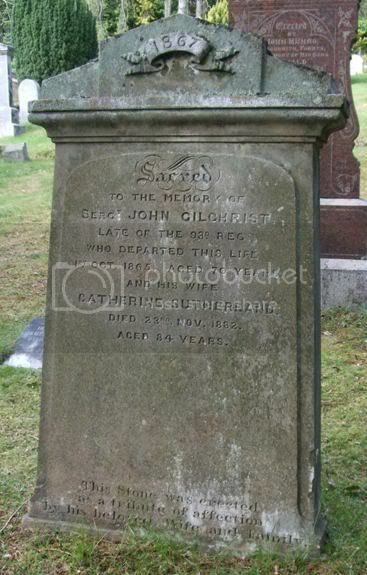 John Gilchrist late of the 93rd Reg who departed this life 1st Oct 1865 aged 70 years and his wife Catherine Sutherland died 23rd Nov 1882 aged 84 years. This stone was erected as a tribute of affection by his beloved wife and family. In loving memory of Ann Urquhart nee MacKintosh died 27.2.1953 aged 80. 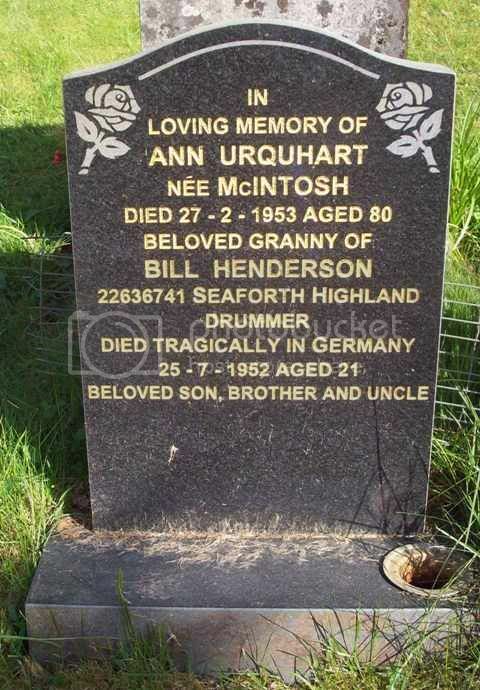 Beloved granny of Bill Henderson 22636741 Seaforth Highland Drummer died tragically in Germany 25.7.1952 aged 21. Beloved son, brother and uncle. 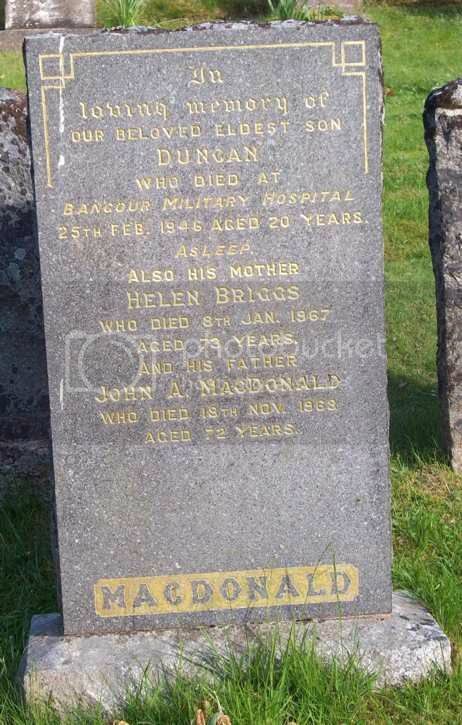 In loving memory of our beloved eldest son Duncan who died at Bangour Military Hospital 25th Feb 1946 aged 20 years. Also his mother Helen Briggs who died 8th Jan 1967 aged 73 years. And his father John A MacDonald who died 18th Nov 1968 aged 72 years. 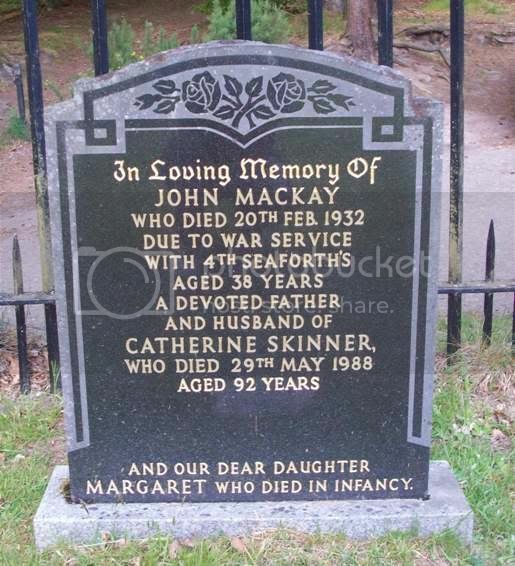 In loving memory of John MacKay who died 20th Feb 1932 due to War Service with 4th Seaforths. Aged 38 years. A devoted father and husband of Catherine Skinner who died 29th May 1988 aged 92 years. And our dear daughter Margaret who died in infancy. 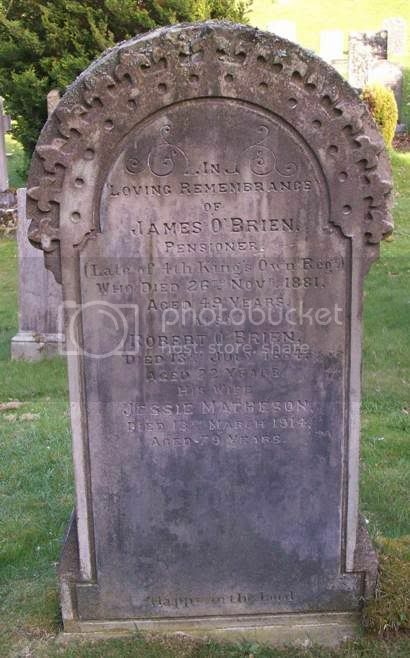 In loving remembrance of James O’Brien, Pensioner (late of the 4th Kings Own Reg) who died 26th Nov 1881 aged 49 years. Also Robert O’Brien died 13th July 1884 aged 22 years. His wife Jessie Matheson died 13th March 1914 aged 79 years. Erected by James Smith in loving memory of his son William who was killed at The Battle of Teb. Egypt 4th Feb 1884 aged 30 years. Also his wife Jessie MacLennan who died at Pilmuir 23rd Nov 1897 aged 64 years. The above James Smith who died at Pilmuir 17th May 1906 aged 72 years. Also his son Alexander who died at Pilmuir 13th Dec 1914. Also his daughter Christina who died at Pilmuir 12th July 1927. 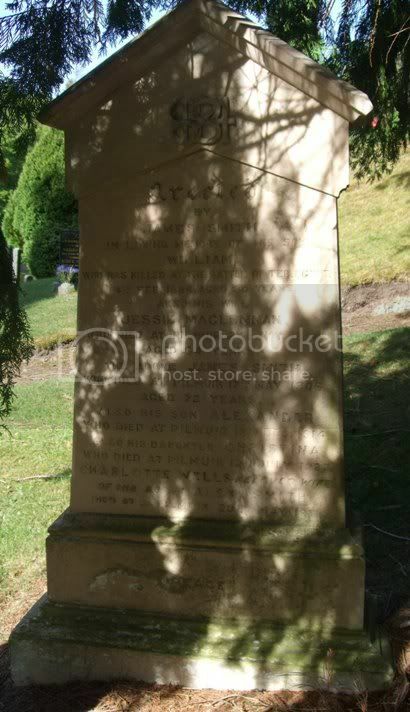 Charlotte Wells beloved wife of above Alex Smith died at 3 Pilmuir 20th May 1931. 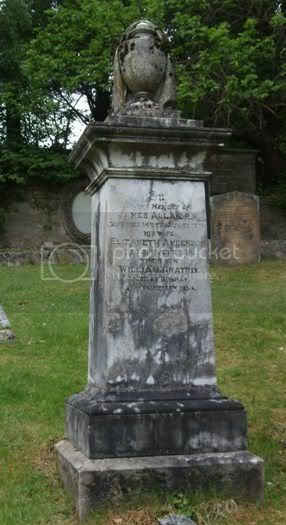 In loving memory of James Allan, RN who died 14th Feb 1838. His wife Elizabeth Anderson died 30th June 1863. Their son William Gratrix died at Bombay 25th Feb 1854. In loving memory of James Hunter, Mason late RSM Sea Hldrs. Who died 12th Aug 1935 aged 54 beloved husband of Margaret Forbes. In loving memory of Hugh McKenzie died suddenly at Cothall, Altyre 19th June 1901 aged 42 years. His wife Catherine Dingwall died 13th June 1923 aged 65 years. Their youngest son Hugh Argylle & Sutherland Highlanders died 21st Aug 1951. 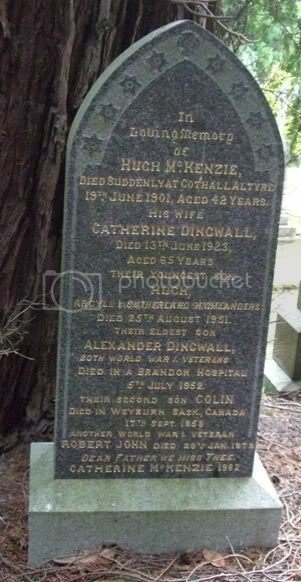 Their eldest son Alexander Dingwall both world war 1 veterans died in a Brandon Hospital 5th July 1952. Their second son Colin died in Weyburn, Sask, Canada 17th Sep 1959 another word war 1 veteran. Robert John died 29th Jan 1979. Catherine MacKenzie 1982.